For those who want to be noticed opt for Tangerine Scream should make it easier to spot at the supermarket! There is no doubt that £20,000 plus is a lot of money to fork out for a Ford Focus ST but oh boy ……… we reckon it’s worth it! What is it? This is not your average Focus, this one has undergone radical surgery and boasts Sports Technologies (ST). It is the third generation Ford Focus ST and in keeping with all things green and lean it is lighter, faster and more fuel efficient than before. Who is it aimed at? 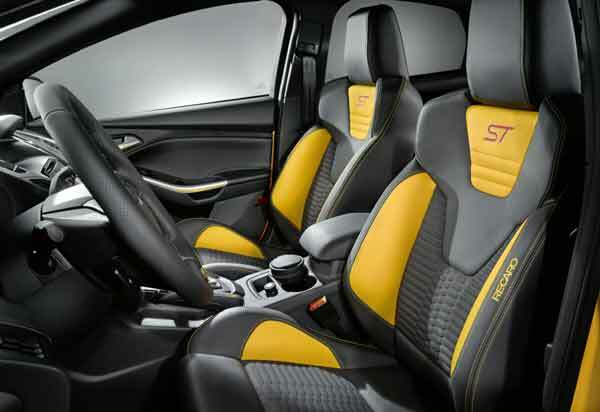 This the ultimate Focus ST, is for the ultimate fast Ford fan. Styling? Ford Fans will spot the ST instantly but others will miss the sporty touches. The roof spoiler, black grille with an ST badge and twin exhausts contribute to the aggressive look of the car but are subtle enough that it doesn’t stand out that much from the regular model. For those who do want to be noticed opt for a bold colour, Tangerine Scream should do the trick and make it easier to spot at the supermarket! Under the Bonnet Press the start button and there’s a thrilling growl from the 2.0-litre four-cylinder turbo-petrol engine. The last Focus ST had a 2.5 litre engine but this time the boffins in Ford have managed to squeeze more power from this smaller engine and it zips through 0-62 mph in 6.5 seconds and has a top speed of 154 mph. What about Inside? Slip behind the extra-thick steering wheel and the Recaro sports seats grip you snugly, possible too snugly for some but we loved them; comfortable and supportive in equal measure. There are a trio of gauges displaying turbo boost pressure and oil pressure and temperature and sporty details throughout. From a practical perspective, the ST delivers as much space as the regular version so for drivers with families but the desire for a hot hatch it fits both bills equally well. On the Road? Take the ST on a twisting road and the grip is supreme, it simply sticks to the road and even at low engine speed it summons power at will. Built to race the steering is razor sharp and the gears silky smooth. The suspension is firm but never harsh; occupants are left shaken rather than stirred! 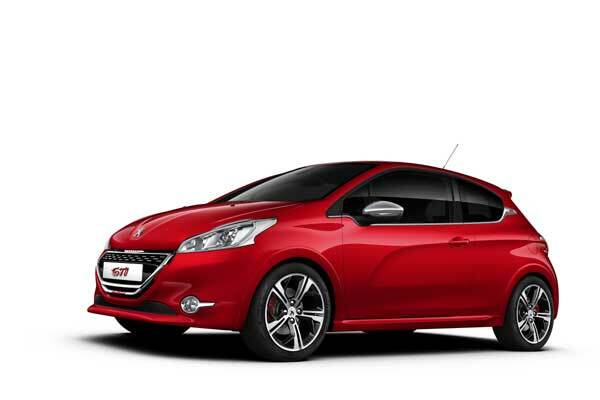 This is a car which remains completely composed and inspires confidence at the wheel. What about fuel economy? On a combined cycle of city and motorway the ST returns 39.2mpg although we never managed to get near that figure during our week driving it. CO2 emissions are 169g/km. Okay so the Verdict? Ford knows a thing or two about making humble cars go fast and the Focus ST does not disappoint. There are few cars that can be so sensible and so much fun. Around town it is surprisingly comfortable and practical and perfectly civil but it’s on twisted back roads that the ST comes into its own. It is simply stunning to drive. 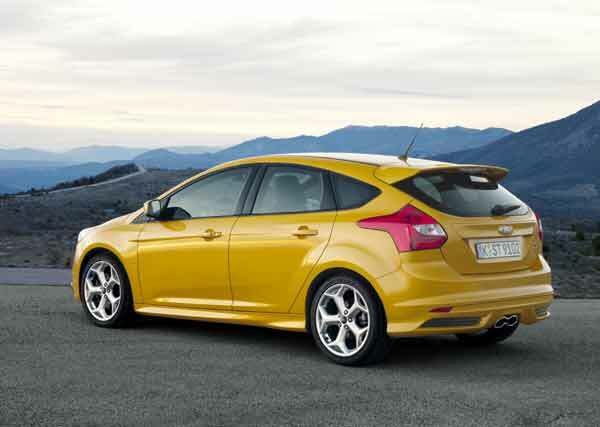 The Focus ST is for those who want a hot hatch with room for the kids plus luggage. Engine: 1,999cc EcoBoost four-cylinder turbocharged petrol engine putting out 250bhp @ 5,500rpm and 360Nm of torque from 1,750rpm.